Tropical plant research foundation, Bulletin no. 9. 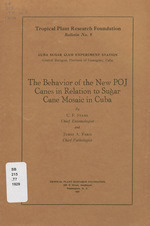 At head of title: Cuba Sugar Club Experiment Station. by C.F. Stahl and James A. Faris. The new POJ varieties, which include POJ 2714, POJ 2725, POJ 2727 and POJ 2878, are of special interest on account of their resistance to the mosaic disease. With this apparent inherent resistance these canes offer much promise as substitutes for more susceptible varieties and at the same time show evidence of being better yielding canes. In certain districts where mosaic spreads rapidly and causes much injury the need of such resistant varieties is especially urgent. In fact, it is in such districts that roguing cannot be maintained on an economical basis under present conditions and the only other alternative now known is the use of resistant varieties. On account of the possible utilization of these POJ canes as a means of controlling mosaic, they have all been under observation, both in the field and under controlled conditions, for varying lengths of time. More information has been accumulated on the behavior of POJ 2714, POJ 2725 and POJ 2727, due to the fact that they have been available for study during a longer period of time, than have the varieties POJ 2878 and POJ 2883. The two latter varieties are now available and information is being accumulated as fast as possible. The results as a whole are sufficiently convincing and pertinent in some respects to make the publication of them desirable at this time. The following chart gives the heredity of these POJ canes (Fig. 1). It will be seen that the parents of POJ 2714, POJ 2725, POJ 2728 and POJ 2883 are POJ 2364 and E. K. 28, and that the grand parents are Kassoer, POJ 100 and E. K. 2. On the other hand POJ 2727 is a cross of POJ 2364 and Batjan and two of its grand parents are Kassoer and POJ 100. From the information that follows it will be noted that, while POJ 2714, POJ 2725, POJ 2878 and POJ 2883 are of the same parentage, the first three are resistant to the mosaic disease, while the fourth is very susceptible. This is just what is to be expected from the offspring when resistant canes like Kassoer are crossed with susceptible canes like POJ 100. The first generation canes, (one of which is POJ 2364), carry both resistant and susceptible characters in their reproductive cells. When this cane is crossed with a susceptible cane, the offspring will include not only resistant but also susceptible varieties. The pathologist must then determine the relative susceptibility of all of these seedlings, not only to mosaic but to other diseases, and thus eliminate those which are too susceptible for field use. Of those that prove sufficiently resistant to the various diseases which are to be controlled, we may then select varieties which have satisfactory sucrose and field characters. were planted with healthy seed of the variety to be tested, row 4 with mosaic infected Cristalina, rows 5 and 6 with healthy seed of a variety, and so on, until all the varieties were planted. The final row was planted to mosaic infected Cristalina. By this method every variety was grown by the side of mosaic infected Cristalina. A row of healthy Cristalina was included as a check. A considerable number of varieties were tested but only those of special interest in this discussion will be included. The results are given in Table I in such a way as to show the increase in the amount of the mosaic and the comparative conditions of some of the well known varieties. From these data it will be seen that the three POJ varieties, POJ 2714, POJ 2725 and POJ 2727, are very resistant to mosaic infection though they are not completely immune. However, their resistance is sufficient to entitle them to be called "commercially immune" by which is meant that in field practice they may be considered sufficiently resistant to the mosaic disease that it ceases to be a major concern. noted that the plants were normal and close observation revealed the fact that the stalks which had been marked were dead. The plants were cut back and the ratoons were apparently normal. Such behavior is not uncommon in this variety as will be shown in experiments described later. In the case of two plants of POJ 2725 planted at the same time as the POJ 2714, the mosaic stalks seemed to grow equally as well as the healthy ones but the symptoms were well marked until the canes were cut. The first, second and third ratoon crops did not show any symptoms of mosaic. The showing of POJ 2883 is of particular interest inasmuch as this variety was developed in the same way that POJ 2714 and POJ 2725 and POJ 2878 were. The results show that it is a very susceptible variety, being even more susceptible than Cristalina. A number of different varieties have been inoculated by means of Aphis maidis Fitch under controlled cage conditions. While these artificial conditions have some influence on the results, it is considered that the information is satisfactorily accurate. The data in regard to the difficulty of inoculation of certain varieties and the susceptibility of others are comparative. All inoculations were made when the plants were from 3 to 6 inches high, and 50 aphids which had previously fed for two days on mosaic plants were used. The results are shown in Table II. POJ 2883 6 6 0 100. The resistance of POJ 2714, POJ 2725 and POJ 2727 to mosaic infection, is again demonstrated in these experiments. They were all hard to infect but POJ 2725 seemed to be a trifle more easily infected than the other two varieties. The figures for POJ 2883 and POJ 2878, while insufficient to warrant definite conclusions, indicate that POJ 2883 is very susceptible and POJ 2878 decidedly resistant. This confirms published reports from Java concerning these varieties. The reaction of the plants after they had contracted mosaic was observed in connection with the inoculation experiments. Plants of POJ 2714, POJ 2725 and POJ 2727 which had been infected when about 4 inches high were transplanted in the ground and kept under observation. The manifestation of the symptoms in the leaves and the progress of the disease in the plants were noted and will be discussed separately. The symptoms in the leaves are quite distinctive when compared with those in Cristalina and vary slightly in the three varieties. The leaves of POJ 2714 usually exhibit wide yellowish blotches which affect only a part of the leaf and as a rule take the form of long wide stripes. In POJ 2725 the striping is not so evident and often the entire leaf is affected. The blotches are coarse and resemble thosa of POJ 2714 in color. It is quite common to find leaves which show only a few isolated, indistinct blotches and in this condition it is difficult to recognize the symptoms. One case has been noted where the symptoms disappeared from the leaves and the entire stalk appeard normal. The leaves of POJ 2727 usually have the entire surface affected. The typical blotches form a coarse pattern that in some respects resembles the pattern in Cristalina leaves (Fig. 3). The effect of Mosaic on the stalks is manifested in several ways. In some of the susceptible varieties the stalks show conspicuous cankers which are the result of the disease. Such cankers have never been noted on POJ 2714, POJ 2725 and POJ 2727. Another effect of mosaic on the stalks is dwarfing and shrinking. This is particularly noticeable in POJ 2714. The stalks are so severely injured that they die out within a comparatively short time. With POJ 2725 and POJ 2727, however, there is no apparent effect on the stalk, the mosaic stalks having as good an appearance as the healthy ones. In order to study the distribution and effect of mosaic in the stalk in these resistant varieties a number of stalks, the leaves of which showed mosaic symptoms, were cut up at various times and the eyes planted separately. Each eye was numbered consecutively, starting at the top of the stalk, and the plants from them were usually grown in pots under cover. The number of eyes giving mosaic plants was quite variable, but no stalks were encountered which produced mosaic plants from all of the eyes, as is the usual case with the susceptible varieties. Unfortunately, poor germination was obtained in many cases, especially with POJ 2727 and POJ 2725. These results are shown on the diagrams in Fig. 2. POJ 2725 gave mosaic plants but further trials will have to be made on account of the poor germination. The main point of interest is the fact that the mosaic is not distributed throughout the whole stalk, as it is in the susceptible varieties. A number of the healthy plants obtained from eyes in these stalks have been grown, under observation through the first ratoon and it was found that they remained healthy. Seed pieces cut from these plants always gave 'healthy plants. not, however, favorable for best growth. While the behavior of the stools may vary somewhat under different conditions, it is considered that the observations reported here will indicate the tendency of the plant in its reaction to mosaic. A stool of POJ 2714 developed seven stalks during the first year. Four of these stalks showed typical mosaic symptoms and three were apparently normal. Within a short time the effect of the mosaic was evident. The healthy stalks made a normal growth under the conditions to which they were subjected and the mosaic ones became stunted and slowly died. At the end of 18 months all of the stalks were cut. The comparative size of the mosaic and healthy stalks is shown in Fig 4. None of the mosaic infected stalks in this stool threw off the symptoms. A number of other stools of POJ 2714 affected with mosaic have been grown under observation. Their reaction was similar to that described above, the main variation being in the percentage of mosaic stalks developed in the stools. In all cases some of the stalks were healthy. The POJ 2727 stool subjected to the same conditions as POJ 2714 developed 8 stalks all of which showed typical symptoms of mosaic. There were no healthy stalks during, the, first year and there was no evidence of recovery. As far as could be determined the growth was about normal. Other stools being grown have not developed sufficiently to warrant conclusions, but there is evidence of considerable variation. It is probable that there will be a few healthy stalks in some of the stools at the end of the first year and possibly one case of recovery. The symptoms on the POJ 2725 stool were at all times isolated and indistinct. Fourteen stalks were developed during the first year, two of which showed evidence of recovery. The symptoms in these two stalks disappeared and the plants which grew from the eyes were healthy. Other plants under observation are too young to show final results. It is probable that the manifestation of the symptoms will vary considerably, but in this case there was more evidence of actual resistance to the progress of the disease in the plant than in the other two varieties. The growth was apparently normal. Up to the present time all ratoons -of POJ 2714 and POJ 2727 which have grown up after cutting have been healthy. IEyes planted from these healthy stalks have given healthy plants. In the POJ 2725 stool, however, two stalks in the first ratoons, out olf a total of fifteen, showed symptoms of mosaic. One of these stalks recovered and the other showed symptoms at the time it was cut. The second ratoons have all been free from symptoms. The usual manifestation of the mosaic symptoms in these POJ varieties and the general reaction of the plants suggested the possibility that there might be some change or modification of the virus after passing through the plant. In order to test this possibility, plants of POJ 27147 and POJ 2725 were inoculated by means of Aphis maidis with virus from Cristalina plants showing typical mosaic symptoms. After the POJ plants had developed symptoms, aphids which had never fed on mosaic plants were allowed to f eed on them. Later these aphids were transferred to healthy CriStalina and B H 10 (12) plants. The symptoms which developed as a result of this inoculation were, as far as could be determined, typical for the varieties and the same as those noted on the plants from which the mosaic was originally obtained. If there is any change in the virus after passing through the P01 plants this change is not revealed in the symptoms. This brings us to a consideration of several terms which are being constantly used in regard to sugar cane mosaic, the meaning of which it is necessary to know in order to understand the difference in the reaction of the cane varieties in the above table to the disease. By the term resistance to cane mosaic Iwe understand the power which certain plants have to ward off the infection. When this ability to ward off the disease is complete it is spoken of as immunity. Therefore, the term resistance is relative and varies from the extreme case of complete susceptibility on the one hand to complete inm-rnity on the other. Some canes, even though they take the disease readily, seem able to, grow about as well when infected as when healthy. It is very doubtful that this is the case in any of the varieties we have under observation, although the POJ 36 is reported to be practically so. Canes which readily become infected but which seem to be little affected by the disease are spoken of as being very susceptible but tolerant to the malady. The use of tolerant in. this connection is convenient, but it is only partially true, as the leaves are badly mottled by the mosaic. The planting of the so-called tolerant varieties in areas of mosaic infection even though they, themselves, suffer little from the disease, is a very bad practice from the standpoint of disease control, as a focus of infection is created from which the disease spreads readily to susceptible varieties. Therefore, the field planting of such canes as POJ 36 or POJ 2883 should not be undertaken until the mosaic disease is under controlIn fact, in areas otf low mosaic infection, the planting of these varieties might iend to increase the disease. Without exception, where other things are equal, the mosaic resistant canes should be given the preference not only where mosaic is an acute problem at present, but also in zones free ,of mosaic.